«©NCSX» The Dark Knight tackles Gotham's seedy underbelly in Ubisoft's side scrolling platform game. 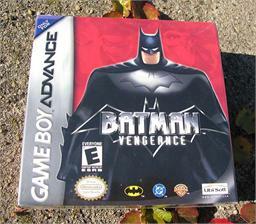 Players get to use special Batman equipment such as the Batgrapple and Batarangs to help Bats do his thing. NCS' remaining inventory of Batman Vengeance for the Gameboy Advance is new, factory sealed, and in VG condition. Some copies of the game may have slight dents and dings due to years and years of warehouse storage. Pricing at US$20.90 each which includes "free" shipping by USPS Media Mail within the U.S. This document is ©NCSX 2001, 2008. All rights reserved. No reproduction in whole or in part of this document may be made without express written consent of National Console Support, Inc. Hot on the heels of last week's Iron Man Cosbaby set, Hong Kong's Hot Toys has announced the Batman Cosbaby collection which features seven characters. Even though the upcoming Batman Kubrick toy makes the Gotham City crusader appear constipated, we're going to keep a set for our Kubrick collection.